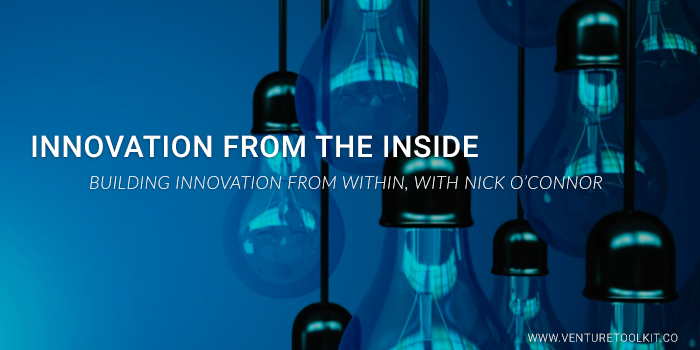 Nick O’Connor, the founder of Venture Toolkit and the Innovator’s Program, discusses how he founded Venture Toolkit to create programs that customers love. To read his early startup experience, click here. Three years ago I had the opportunity to help SanDisk create its own innovation ecosystem, thanks to the help from innovation thinkers, Steve Blank and Colm Lysaght. The SanDisk Business Accelerator was a cohort accelerator program focused on customer development for early stage internal teams in Milpitas, CA. It was a modest beginning with five internal innovation teams working part-time for three months with the goal of getting enough evidence to convince the SanDisk Exec. management team to provide funding for them to go full-time. Over the past three years, I have completed twelve cohort based accelerators programs sponsored by companies such as: Ericsson, AT&T, Red Hat, Citrix, Cisco, and Tata Telecom; for 80 teams, 42 startups, and 38 internal innovation teams with some very promising outcomes so far. On the startup side we now have ten funded startups (~$1M), four acquisitions by companies like Citrix, PTC, and Facebook, many bootstrapped and profitable startups. We are also proud that we have helped a number of startup founders get enough evidence within a few weeks to either shut down or pivot their startup. On the internal innovation side, we have experienced the full catastrophe of the good, the bad, and the downright ugly. On the positive side, we have a number of internal new businesses and a spinout. On the not so good side, we had one particular painful learning curve when a team did an amazing job and built a compelling solution that their customers loved, in a market that was ready to take off, but the parent company decided that it did not fit into their strategic objectives. Needless to say, the internal team founders were not too thrilled with this outcome. Early on, we also had a number of internal team founders who had impressive technical skills but not much passion or curiosity for their customers. This is something that we now filter for upfront. Most importantly, I have had the opportunity to provide an apprenticeship to over 200 startup/internal innovation founders as they start their entrepreneurial journey. I also got to work with executives and innovation leaders who really believe that long-term company growth can only be achieved by developing their top talent to create new business. Over the course of twelve programs, the lessons have been immense. We measure the impact of every workshop and on every session on founding team’s ability to make meaningful progress. This resulted in a lot of changes in our recruiting process and how we operate the program. We will not be happy until we have built something that our customers (founders and innovation leaders alike) really love! We are now in the middle of program #13 with eight startups sponsored by Cisco in Bangalore and it is really exciting to see that this is the best program we’ve run in India so far, and we plan to kick off program #14 in Raleigh with three startups and three internal innovation teams sponsored by Citrix and RedHat in mid-July. Most “big companies” are struggling for growth right now and if not, they are certainly concerned about their capacity for long-term growth. As new technologies and business models emerge, the possibility of disruption is an inevitable reality. The business landscape has changed. It’s no longer about the big fish competing with each other, but with armies of startups going after a company’s individual products and services. A surge of emerging startups are threatening big banks like Wells Fargo, and logistics companies like Fedex, are disrupting the automobile industry, even the Apple iOs isn’t safe. With startup’s valuations soaring, acquisitions are becoming less effective while partnerships are complex to set up and often fail. Developing one’s internal talent to innovate is quickly becoming the most effective strategy for long term growth. How to create their your own army of internal innovators to build up their immunity to external disruption. Big companies need to disrupt themselves before someone else does but first they need to develop their own innovation “muscle.” Executives need to be willing to carve out resources to develop their top talent so they can engage with current and future customers to develop new products needed for long-term growth. Big companies are now in the process of adjusting to this new world; some have already failed and many more will follow. The successful big companies will emerge with a different look. Exactly what they will look like is not clear yet. Some early patterns of success are founder-led technologies companies like Amazon, Google, Facebook, and previously, Apple. Another example has emerged with SAP, who recently announced SAP.io, a strategic investment model for both internal teams & external startups. Venture Toolkit is delivering programs for companies, like Cisco, to partner successfully with startups. We developed the Innovators program to help companies like Citrix and Red Hat innovate, by creating an ecosystem of internal & external innovators around their companies in Raleigh, Santa Barbara, Bangalore, and Silicon Valley. We certainly live in interesting times and it is truly exciting to be helping shape the next wave of innovation around the globe. Join the wave of innovation today, and find out more about how Venture Toolkit can help you create win-win partnerships with startups and high growth businesses by starting with more than a good product, but one that your customer will love.